I don’t remember seeing Home Alone 2: Lost in New York when I was a kid, but that doesn’t mean I was not aware of the movie’s toy marketing. I am of course talking about the Talkboy cassette recorder. I wanted one so bad. My parents refused to buy me one, because it would be annoying for them, and I’d lose interest in the toy about a week after receiving it. They may have been right, but I still think the entire family would have enjoyed this toy. About the movie: it is not great. Home Alone is much more fun, and dare I say it– plausible. Lost in New York stretches the original premise to ridiculous extremes. Furthermore, its attempts to cash in on the sweet sentimentality that made the first enjoyable feel forced. I understand that family films like this work best when adhering to a formula, but Home Alone 2 tries too hard to shove this plot into the outline that created a surprise hit two years prior. My biggest problem with Lost in New York is that the violence is just so violent. I’m not saying that this film is gory or inappropriate for children, only that the booby traps set by little Kevin (Macaulay Culkin) this time around would do more than incapacitate or mildly maim the burglars as they did in Home Alone. I’m no expert, but setting someone’s head on fire and then tricking them into dousing it in flammable liquid would probably kill them. It’s scenes like this that are less funny and more cringe inducing. It’s uncomfortable to watch, and overall much less fun. There is also a lot of forced sentimentality that I didn’t care for. In Home Alone Kevin learns that his scary neighbor isn’t really scary at all, and the man eventually comes to his rescue. The exact same premise happens in Lost in New York, instead featuring a lonely bird lady hanging out in Central Park. I don’t really get why this subplot was needed. Couldn’t Kevin have learned some other lesson, rather than one he’s already learned? As with Home Alone, there are big plot points in this movie that have not aged well. Again, cell phones have changed everything. Either Kevin would have had one, or there would have been one in his dad’s bag (which he conveniently has in his possession). More glaringly, the ease with which Kevin winds up on the wrong flight is completely implausible in the post-9/11 world. Mostly though, I really question the responsibility of the McCallister parents. To forget your kid at home is one thing, but to lose track of him in a busy airport is quite another. But at least made sure he made it to the airport this time. Baby steps, I guess? When the first Home Alone film was a smash hit and made Macaulay Culkin a star, a sequel inevitably followed. I actually like what they did with this sequel. I like how it isn’t exactly the same story as the first film, the film makers have found a good way to tell a sequel to the first movie. I definitely have to question Kevin’s parents though. I’m pretty sure if I had left my son home alone a year earlier, I would not be getting on any more planes without being assured my son was on there too. Although, if they let this happen once, why wouldn’t it happen again. 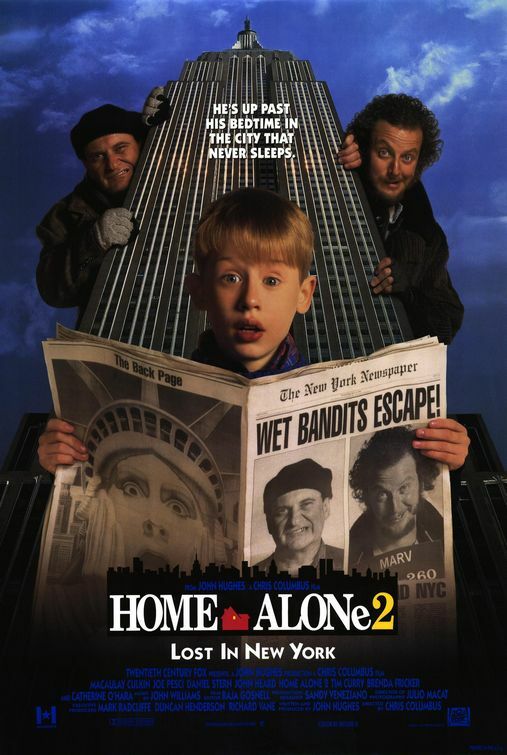 The second Home Alone film begins in similar circumstances to the first one, with Kevin (Culkin) getting embarrassed by his older brother Buzz (Devin Ratray) and starting a fight with him. This leads to more sleepovers in the attic before a family holiday to Florida. Unlike the first film, Kevin actually makes it onto the bus to the airport this time. Due to his family’s inability to set an alarm clock, the group are very rushed at the airport, scurrying like mad to get to their flight on time. During this, Kevin loses his family and follows another man wearing the same coat as his dad (John Heard). Kevin ends up on a flight to New York instead of being in Florida with his family. While there, Kevin has the time of his life thanks to his father asking him to carry his backpack that contained all of his credit cards. Kevin checks into the Plaza hotel and goes on a shopping spree in a toy store. While in New York, Kevin also runs into Harry (Joe Pesci) and Marv (Daniel Stern), the same two burglars from the first film. They have just broken out of prison and looking to rob a toy store on Christmas Eve. Only Kevin knows about their plan and knows he has to stop them. Using his uncle’s apartment that is being renovated, Kevin creates a whole new funhouse of booby traps and pain for these two bumbling burglars to fight their way through. This is pretty much the same story as the first film, but different enough that it doesn’t feel like I am watching the same movie over again. Kevin’s traps are more dangerous than the first, leading to more laughs. As in the first film, Home Alone 2 really only comes alive when Kevin is making Harry and Marv’s lives miserable. The two are good sports though. Hearing grown men scream in pain from a house of pain created for them by a nine year old is very amusing. The first two thirds of the film are a bit slow, but the last sequence makes up for it and you leave somewhat satisfied. There is some fun to be had in the first two thirds of the movie though. It is not all boring. Seeing a nosy concierge (Tim Curry) at the Plaza Hotel try and uncover Kevin’s secret is quite funny, as are Kevin’s attempts to tip the bellboy (Rob Schnieder). I am sure Sally will mention this too, but obviously this whole movie would not even be feasible in a post-9/11 America. The ease at which Kevin gets on the wrong plane is laughable when watching it with 2014 goggles. I am sure it was more believable in the early 1990s, but today it just looks like nearly everyone working for that airline is terrible at their job. Not to mention what terrible parenting must be involved to allow their son to go missing for a second time in two years. Despite this nit-picking, Home Alone 2 is still a fun film. Seeing Kevin outwit the two dud robbers is still very entertaining a second time around.